Lying in the northernmost part of northeast China, Heilongjlang Province is the province with the longest winters. It is situated 121'13"-135'06" east longitude and 43'26"-53'34" north latitude with an area of 469,000 square kilometers. Boasting plenty of rivers, it has over 1,700 rivers, each of which is more than 10 kilometers long. Most of its land is 50-200 meters above sea level. Heilongjiang has a cold-temperate continental climate and a mean annual temperature of 3oC to -2oC -- the lowest temperature can reach -52.3oC, and a mean annual precipitation of 300-700 mm. It has warm, rainy summers with long hours of sunshine, and freezingly cold and long winters. It is divided into 1 district, 12 prefecture-level cities, 19 county-level cities, 46 counties and 1 autonomous county, with a population of 36.89 million as of 2000, mainly including ethnic groups of Han, Manchu, Korean, Hui, Mongolian, Daur, Hezhen, Oroqen and Ewenki. Heilongjiang dishes features venison, such as roasted dog meat, fork cooked wild pig meat, braised deer-tail, and Flying Dragon soup. Ice sculpture, Longjiang Opera, etc. 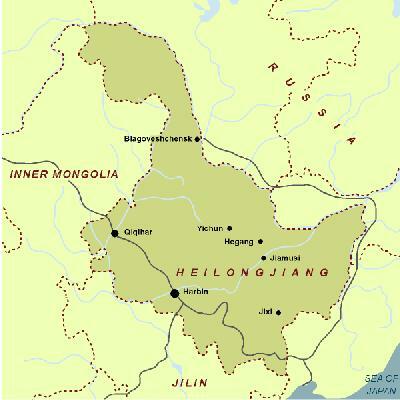 Heilongjiang Province is called Hei for short, with Harbin as its provincial capital. With expanse of flatland and wide areas of fertile black soil, it is one of China's major commodity grain growers. Named after its largest river, its land area includes the country's largest oil reserve. Heilongjiang is one of principal areas of land reclamation and cultivation in China. Its main crops include wheat, soybeans, beet, flax and sunflower which all occupy a significant position in China. It is abundant in forest and land resources and its soil is fertile. Among minerals, coal, petroleum, gold, and graphite all hold key positions in China. Heilongjiang is also China's most important base of forestry, ranking No.1 in both timber reserve and production. The Greater and Lesser Hinggan Mountains are its major forest area. The main industries comprise machine building, coal, petroleum and timber processing, in addition to papermaking, beet-sugar refinery, petrochemicals, flax-textiles, power-generating equipment, industrial boilers, etc. Harbin, Qiqihaer, Jiamusi and Mudanjiang are its major industrial centers. Daqing is one of China's most important bases of petroleum industry. Heilongjiang Province is blessed with a variety of unique tourist attractions, including the Wudalian Pond, an internationally known natural volcanic park; the Jingbo Lake, China's largest alpine dammed lake; the vast Xingkai Lake stretching over China and Russia; the Manchurian Crane Sanctuary, well known inside and outside of China; a beautiful, scenic forest under a volcanic crater; and the Polar Village, where the mysterious aurora borealis can be observed. 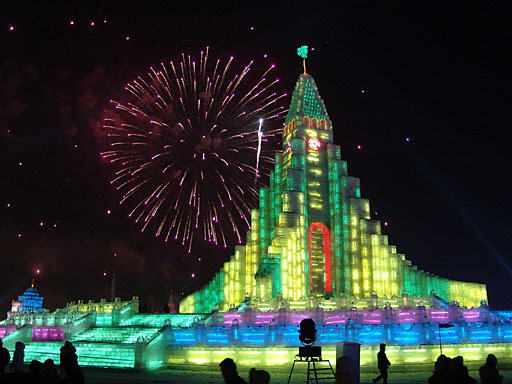 Harbin's annual Snow Festival adds charm to the beautiful northern landscape with the perfect harmony of its natural ice and snow scenery and the exquisite man-made ice sculptures. The boundless great plain, the magnificent forests, snow-bound mountains, countless precious wild animals like swan red-crowned crane, Northeast Tiger, and Northeast Leopard as well as the unique local culture are attracting thousands of tourists home and abroad.